This is your one and only chance to get this right. Make a mistake out there and we'll be bringing you back in a ziploc baggie - that is, if we don't have to stake you out, decapitate you, and then burn the body! * The Top 10 Most Wanted Vampires in the World! Whether you are a player or a gamemaster, this book has something for you! Guaranteed to be more fun than a sharp stake in the eye! 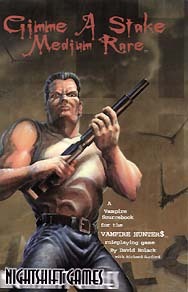 The Vampire Hunters roleplaying game is required for play.